Fast-food workers have been continuing the fight for an increased minimum wage with protests in Washington and outside the of McDonald’s headquarters — where 100 of the 2,000 protestors were arrested. Workers, 325 of which marched in their uniforms, according to Bloomberg, are demanding an increase to $15 an hour. The U.S. headquarters shut down and had its own employees work from home to avoid traffic from protestors. “The closing reflects McDonald’s refusal to address the growing concerns of workers and failure to take action to raise wages,” said Deivid Rojas, the communications director for Workers Organizing Committee of Chicago, according to Bloomberg. “For the last four years that I’ve worked for McDonald’s, I was expected to count my cash register before clocking in. I also have to count my cash register after clocking out. This took about 20-30 minutes everyday. McDonald’s has literally been stealing my wages and my time every day for the last four years,” said Adriana Alvarez, an employee at McDonald’s and mother, according to Fight For $15, of the Workers Organizing Committee of Chicago. The minimum wage movement is much larger than just McDonald’s PR problems, however, with an enormous force behind it. Other workers, such as those from Punch Neapolitan Pizza, are demanding that their $7.25 an hour wages be upped as well. The accumulated effort is resulting in what looks to be the largest fast-food wage strike in history, spread globally, with 150 cities in the U.S. and eighty cities in thirty other countries. The protests outside McDonald’s headquarters is just the latest more invasive strategy to garner awareness for the movement. On top of that, the fast-food industry isn’t the only group looking for a minimum wage increase, it’s just one of the ones without a union to aid in the fight — something protestors are looking to change as well. After Congress failed to pass a national minimum wage increase to $10.10 states have been taking up the effort in the state legislatures, such as in the cases of Minnesota and Maryland, or have groups lobbying to get things on a ballot, such as is the case with Raise Michigan’s ballot committee. Some companies are also on board ahead of others, such as Wal-Mart Stores Inc., which said last week, according to The Wall Street Journal, that it wouldn’t be opposed to a national minimum wage increase. Wal-Mart’s president, Bill Simon, pointed out that it is “not a minimum wage payer,” saying that only 5,000 of the 1.3 million Wal-Mart workers make minimum wages across the U.S. Despite such claims, many Wal-Mart workers and labor groups have been highly critical of the business’s practices. While pay may be higher than the minimum in many states, hours are often cut as a result, leading to a barely liveable wage in many cases. “Do you know how hard it is to go to someone that makes $8.85 an hour and tell him, sorry but I have to cut you down to 25.5 hours. These people can barely pay their rent as it is and with no notice we cut their hours,” said one Wal-Mart store manager, according to Jobs with Justice. The focus on minimum wage efforts in the retail and fast food industries only makes sense when you look at statistics on where most low-wage workers are employed. 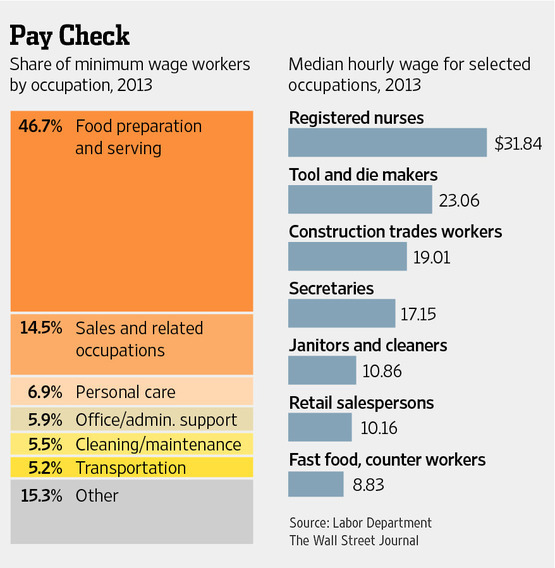 According to Labor Department stats and The Wall Street Journal, 46.7 percent of minimum wage workers in 2013 were in food preparation and serving, and 14.5 percent were in sales and related occupations. Does McDonald’s Have a Bright Future?